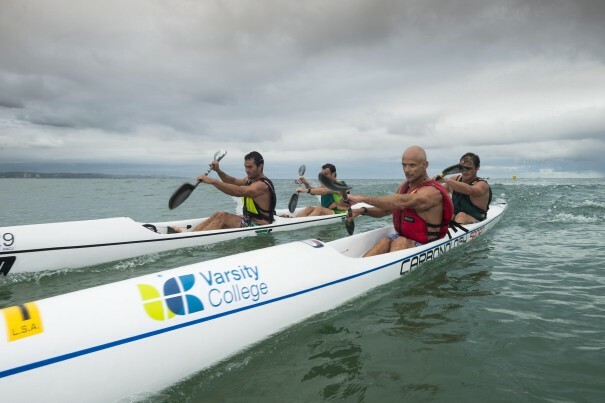 Durban – No surf and magnificently flat seas saw Friday evening’s Thule Surfski Challenge, race four of the 2014 Varsity College Marine Surfski Series, turn into a raw, unforgiving 8km sprint which played right into the hands of the remarkably fit Hank McGregor and Michelle Burn as the respective men’s and women’s series defending champions extended their lead at the top of the 2014 standings whilst hundreds of others enjoyed getting back on the water. 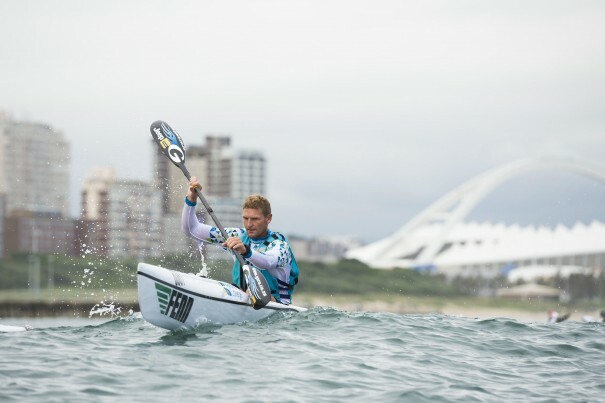 With two wins under the belt from the series’ first three races to date, triple Canoe Marathon World Champ Hank McGregor (Fenn/Team Jeep) notched up his third race victory when he narrowly edged out perennial rival Matt Bouman (Epic Kayaks) after a tightly contested affair throughout the two lap dash around Durban’s bay. The win sees McGregor halfway to achieving yet another series title with paddlers’ best six results from the ten-leg series counting towards the final standings, however there is still plenty to race for for McGregor, particularly as he prepares for the widely spoken about upcoming Dusi Canoe Marathon. “It’s great to get another win!” said McGregor. 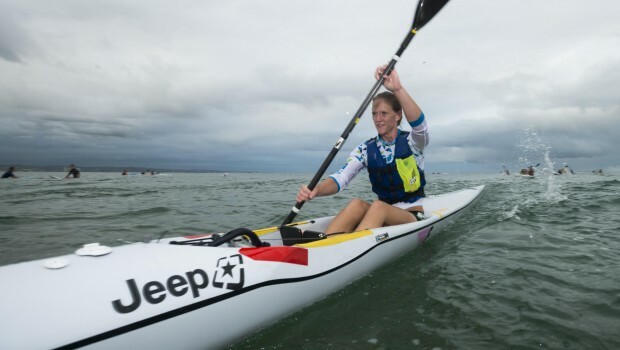 “I will obviously have to start taking iot easy for the next couple of weeks before Dusi so it’s nice to be able to get another win under the belt before then. With no assistance from Mother Nature, McGregor and Bouman were left to square off against one another in the high tempo frenzy where just a single mistake could well end one’s challenge. 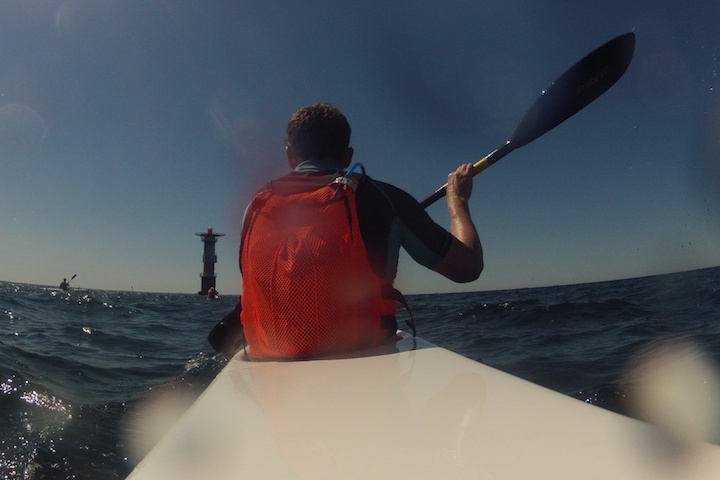 “Out there, there were no waves, no swell, no wind. Nothing!” said McGregor. “Not like the last couple of weeks. 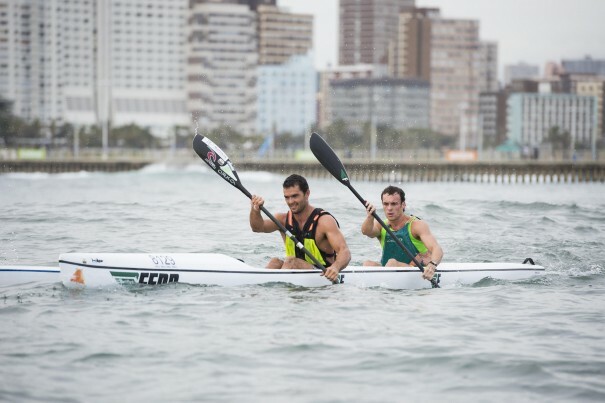 “Matthew (Bouman) and I got away from the start so it immediately became a bit of a two horse battle. I then managed to open up a bit of a gap on him at the start of the second lap and by the end had about 150 meters, so I was happy. “With no assistance from the conditions it was just a good, hard slog the whole way,” he added. Having been in the mix for his third bottom step of the podium result of the series, series coordinator and Varsity College/Team Jeep athlete Barry Lewin was once again edged out in a hard fought end sprint, this time by Jean-Luc Mauvis while masters star Herman Chalupsky showed why he was regarded as one of the country’s leading paddlers in by-gone years as he crossed the line in fifth just seconds behind Mauvis and Lewin. Burn (Fenn/Team Jeep) was the shining light in the women’s race once more as she, like McGregor, claimed her third win of the series, finish exactly a minute ahead of Nikki Russell who in turn was a minute ahead of Jenna Ward. 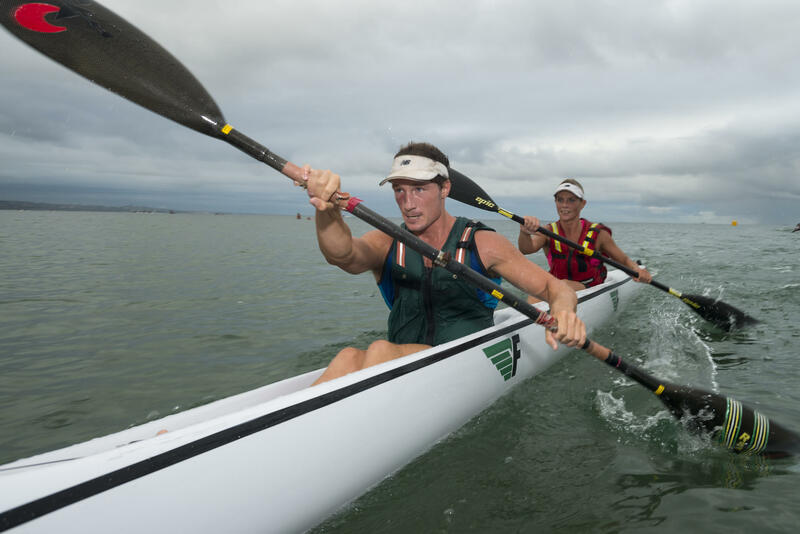 EuroSteel’s Mark Mulder and Dave Chaplin narrowly edged out regular doubles star Wayne Wilson and his partner Shaun Dias in the doubles section, in the process recording their second consecutive victory in the division and giving themselves good confidence ahead of their Dusi assault. 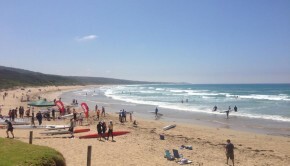 “With the flat conditions out there it was hard to shake someone off your wave. Dave and I felt really good but we just couldn’t get rid of Wayne and Shaun,” explained Mulder. 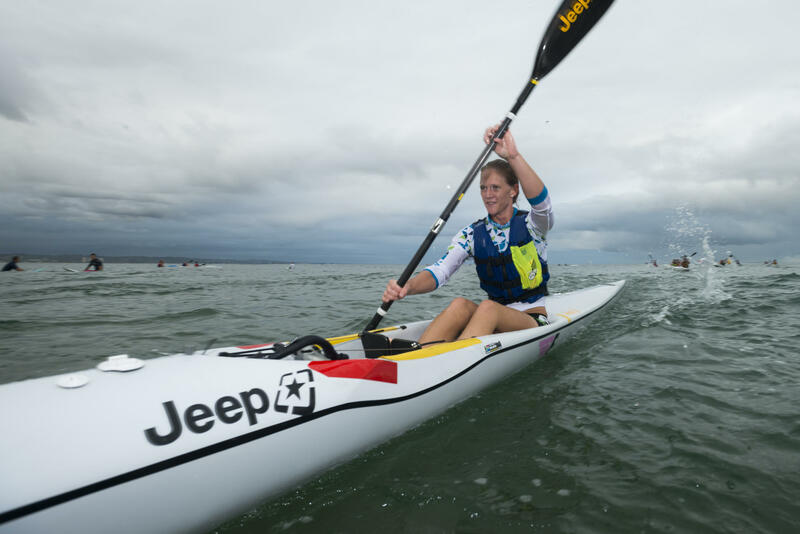 “It was nice to get the win over them in the end though and now we just can’t wait for Dusi! Bring it on!” he chuckled. 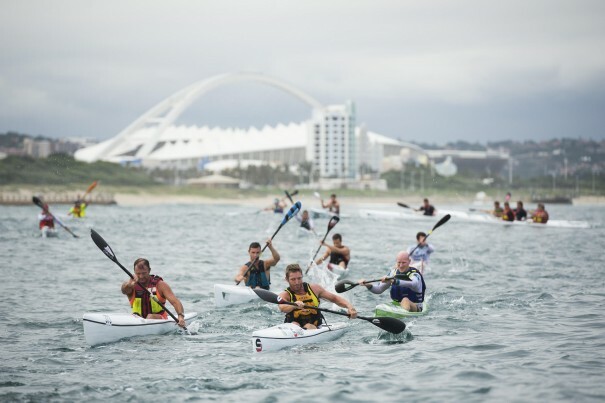 Keagan Kok clinched the junior boys race victory while Ryan Atkins and Julie Cornelius continued their great run of form, claiming yet another mixed doubles race win themselves. 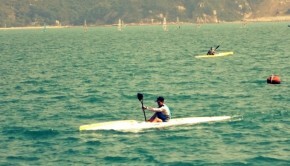 While the conditions created tight, high intensity racing at the front of the field, the respite in the testing surf participants have had to deal with in the first three weeks of the series was welcomed by most and saw numerous novices head out and complete their first 2014 series race, a first race ever for some.